How annoying is it when you’re out and about and you reach into your bag for a touch up… but you’ve left your products at home?…Very! 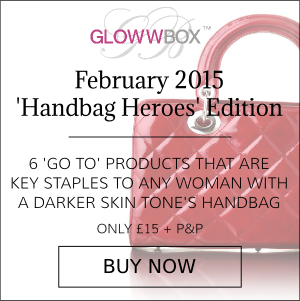 That’s why in this month’s GlowwBox, we’re excited to present our February Handbag Heroes Edition! Packed with 6 beauty essentials that are key staples to any woman with a darker skin tone’s handbag. One of the most exciting products to feature in this month’s edition has to be the small makeup bag from the Vintage Cosmetics Company! Of course we couldn’t leave this out as it’s a true ‘handbag hero’! It’s perfect to fit your make-up essentials in, as well as deceptively roomy. It’s truly an essential for girls on the go. To receive this beauty must-have plus 5 more handbag heroes, sign up here! We know you’ll love it. This entry was posted in This Month's Edition and tagged advice, asian beauty, asian women, Beauty, beauty advice, beauty advice for women of colour, beauty box, beauty box for women of colour, beauty chat, beauty products, beauty regime, beauty samples, beauty tips, black and white, black beauty, black women, brown beauty, cosmetic, essential beauty, fashion, february, handbag, handbag essentials, makeup bag on February 8, 2015 by Vicky.